San Francisco, 1940. "International stake bed truck." Ready to roll up its sleeves and get to work. 8x10 inch acetate negative. View full size. "Stuck in the middle again!" Submitted by Oldtrucker on Sat, 08/11/2018 - 6:25pm. 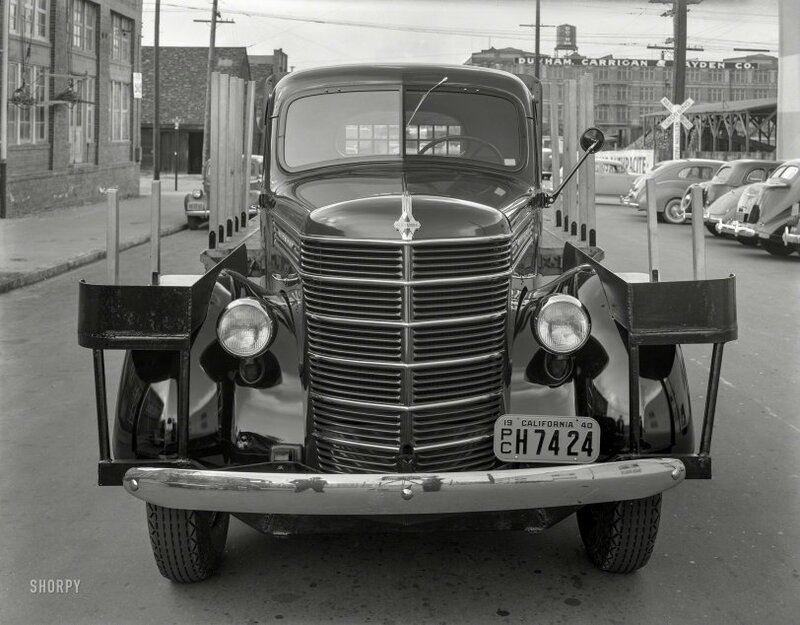 On occasion one can still see trucks of this type, typically built to carry various pieces of steel or pipes, loaded on either side of the doors, as they could be as long as the truck. Drivers had to access the cab through the windows or a roof opening, as the doors would be blocked. I wonder how they paid tolls? Submitted by tterrace on Sat, 08/11/2018 - 1:50pm. Dunham, Carrigan & Hayden was listed at being at 8th and Townsend, but this shot appears to have been taken on Vermont St. The building dates from 1915 and now is part of the San Francisco Design Center complex. Buildings on the left are gone, the space now occupied by an elevated freeway carrying U.S. 101. Submitted by TimB on Sat, 08/11/2018 - 1:21pm. Unusually good opportunity to see the photographer (woman?) in action.